Vasaloppet in English - Vasaloppet’s CEO: We are ready! Vasaloppet's CEO Eva-Lena Frick writes about the last preparations for Vasaloppet's Winter Week 2019. I sit on the couch. Darkness outside my window. Today’s snow has stopped falling, on TV they’re discussing politics, and my heart is warm. A little while ago I came home from the final head functionary meeting in Mora in preparation for this year’s Winter Week, and tomorrow a similar meeting will take place in Sälen. Tonight the hall filled with people who do their part, every year, to support and help each and every participant make their personal dream come true in the Vasaloppet track. Many different functionaries are needed to make this a reality, and it’s similar to laying a puzzle. All the pieces need to fit into place for the puzzle to become whole. We need about 4,000 people to make this happen. Checkpoint managers, road guards, ski waxers, blueberry soup chefs, juice mixers, cucumber slicers, speakers, bus drivers, track machine drivers, doctors and other medical personnel, radio centre staff, communicators, number bib distributors, bag and luggage handlers, masseurs, parking directors, arena builders, film crew and countless others, they’re right now preparing to welcome you to our arena. I want to take this opportunity to earnestly thank all those who, with an inner glow and warm gaze, come back every year when we need your help. 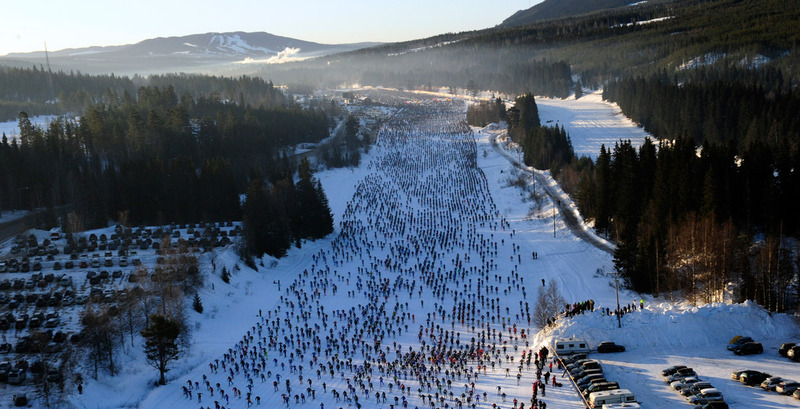 Vasaloppet has been doing this for almost 100 years and during that time we’ve developed huge competency and experience in arranging ski races. From one race in 1922 to twelve in 2019, from 119 participants in 1922 to tens of thousands in 2019; it’s a unique journey in many ways. Vasaloppet has, throughout all this, been focused on development. For this year’s Winter Week we have, among other things, decided to only offer fluorine-free ski wax alternatives in Vasaloppet’s official wax service. We hope this decision will contribute to reduced usage of fluorine products at all manner of ski events in the future. Many other development efforts, small and large, will come into effect. One example is a new start procedure in Öppet Spår, which means shorter wait times before the start. Another is Nattvasan 45, the newcomer among our races this year. It’s a chance at a wonderful adventure, experiencing the joy of gliding along in the arena in the glow of a headlamp, with a friend by your side. If you want to get married after your race we can sort that out too; just take your spouse-to-be by their hand and glide along about 50 metres after the finish line. We have a priest waiting to assist one of the most joyous moments of your life. Vasaloppet can sort out most things. A warm welcome and see you soon!